Laboratorio de Inmunidad Innata, Programa Disciplinario de Inmunología, Instituto de Ciencias Biomédicas (ICBM), Facultad de Medicina, Universidad de Chile, Santiago, Chile. During an infection, one of the principal challenges for the host is to detect the pathogen and activate a rapid defensive response. The Toll-like family of receptors (TLRs), among other pattern recognition receptors (PRR), performs this detection process in vertebrate and invertebrate organisms. These type I transmembrane receptors identify microbial conserved structures or pathogen-associated molecular patterns (PAMPs). Recognition of microbial components by TLRs initiates signaling transduction pathways that induce gene expression. These gene products regulate innate immune responses and further develop an antigen-specific acquired immunity. TLR signaling pathways are regulated by intracellular adaptor molecules, such as MyD88, TIRAP/Mal, between others that provide specificity of individual TLR- mediated signaling pathways. TLR-mediated activation of innate immunity is involved not only in host defense against pathogens but also in immune disorders. The involvement of TLR-mediated pathways in auto-immune and inflammatory diseases is described in this review article. Key terms: Toll-like receptors, Innate Immunity, cytokines, MyD88, NFκB. Host defense against invading pathogens is driven by the immune system that can be divided into two branches: innate and acquired immunity. Innate immunity recognizes invading microorganisms as non-self, triggering immune responses to eliminate them. Acquired immune response identifies specific pathogen peptides presented by antigen presenting cells and activates humoral and cellular immune responses. At the moment, both immune responses have been characterized separately; in the immunology field attention has been mainly confined to acquired immunity. However, the innate immune system in mammals has yet to be fully studied. Although mammalian innate immune cells, represented by macrophages and dendritic cells are known to be activated by microbial components (non-self), such as lipopolysaccharide (LPS) from Gram-negative bacteria, a specific receptor for LPS recognition remained unknown for long time. In the late '90s, Toll was described to be an essential receptor for Drosophila defense against fungal infection, restricted to an innate immune response (1). One year later, a mammalian homologue of the Toll receptor, Toll-like receptor 4 (TLR4) was shown to induce expression of inflammatory genes (2). In addition, a point mutation in the TLR4 gene, has been identified in a mouse strain that is unresponsive to LPS ß). These studies have made innate immunity a very attractive field of research. In this review, we will show the mechanisms by which innate immunity is activated through TLRs and connects to adaptive immune responses. We will first describe the TLR characteristics related to bacterial and viral recognition, then how TLR signaling pathways are activated and which are the intracellular regulators and regulatory receptors involved in this process. Finally, an analysis of their participation and relevance in diseases will be detailed. Activation of innate immunity is a crucial step in antigen-specific acquired immunity development. The primary response to pathogens in the innate immune system is triggered by Pattern Recognition Receptors (PRRs) that bind Pathogen- Associated Molecular Patterns (PAMPs), found in a broad type of organisms. Among the most important families of PRRs are the TLRs which recognize, with selectivity, a large number of varied and complex PAMPs. Seventeen years ago, the first Toll genes were discovered in Drosophila, associated to dorsal-ventral embryonic polarity (4). The Drosophila Toll protein codifies a transmembrane protein homologue to the interleukin-1 receptor (IL-1R), Toll/IL-IR (TIR) domain (5). Further studies showed that Toll has an essential role in the innate immune response, as mutation of any protein involved in TLR signaling pathway decreases survival after fungal infection (1). Different human homologues of Drosophila Toll protein were identified; nowadays 11 TLRs have been identified in mammals (6). TLRs are evolutionarily conserved proteins that also have a highly conserved intracellular TIR domain involved in protein-protein interaction and signaling activation. The extracellular domain, with Leucine-rich repeats (LRRs), is related to ligand recognition. LRR motifs vary among TLRs, although how they can discriminate between different PAMPs still remains unclear. TLR 1, 2 and 6. One of the most studied TLRs is TLR2, that recognizes PAMPs from Gram-positive bacteria, including lipoproteins, lipopeptides, peptidoglycans and lipoteichoic acid, but also lipoarabinomannan from mycobacteria (7), phenol-soluble modulin from Staphylococcus (8), zymosan from fungi (9) and glycosylphosphatidylinositol from Trypanosoma cruzi (10). It remains unclear how a single receptor can recognize such a broad diversity of stimuli. A possible explanation is the association between TLR1 and TLR6 which were demonstrated to form heterodimeric complexes with TLR2 (Figure 1) (11, 12). TLR6 association with TLR2 induced recognition of diacylated lipopeptide (11) but TLR1-TLR2 heterodimer binds preferentially triacylated lipopeptides (12), and this discrimination might be related to the LRR domain topology (13), a unique property for TLR2. Fungal recognition may involve TLR2 association with members of the lectin receptor family, that may enhance its activation by ß-Glucan ligands (14). Surprisingly, TLR2 expression and activity have been shown to be cooperatively regulated by pro- and anti-inflammatory molecules, such as tumor necrosis factor a (TNFa) and glucocorticoids, respectively (15), contrary to reports in relation to glucocorticoids that classically counteract expression of adaptive immune molecules. These observations encouraged the authors to study the intracellular mechanisms that may account for the synergic response to pro- and anti-inflammatory molecules observed on the innate immune response mediated through TLR2 (16). TLR 4. TLR4 importance in innate immune response was initially demonstrated in C3H/HeJ and C57BL/ lOScCr mice strains that are resistant to endotoxic shock, by presenting a mutation in TLR4 gene ß). This receptor is essential for LPS detection but, like TLR2, TLR4 recognizes other molecules from different origins, including some agonists derived from plants. TLR4 can also recognize taxol (a strong antitumor agent in humans) derived from Taxus brevifolia (17), and a respiratory syncytial virus fusion protein (18). Furthermore, TLR4 is activated by endogenous ligands, such as heat shock protein 60 (HSP60), HSP70, fibronectin, hyaluronic acid, fibrinogen and heparan sulfate. LPS recognition by TLR4 requires the formation of a protein complex containing accessory molecules: LPS is generally bound to LPS-binding protein (LBP) present in the serum, this complex is firstly recognized by CD14 receptor (Figure 1), strongly expressed in peripheral blood monocytes and macrophages (19). Once bound to CD14, LPS comes in close proximity with TLR4; however the efficient triggering of an inflammatory response requires the expression of the secreted protein MD-2 (Figure 2) (19). In humans, a number of polymorphic alíeles of TLR4 have been identified, that have been related to an increased susceptibility to develop diseases, such as Crohn's disease and septic shock (20). TLR 5. The flagellum is a complex structure required for bacterial motility and is composed among others by the protein flagellin. TLR5 recognizes a flagellin portion derived from Gram-positive and negative bacteria (21). This protein region induces inflammatory mediators, such as TNFα and IL-8 in epithelial cells (22). Recent studies show that the TLR5 alíele polymorphism 392STOP abolishes flagellin signaling and has been associated with Legionella pneumophila pneumonia (23). TLR3, TLR7, TLR8 and TLR9. Adequate host defense against viral infections involves rapid pathogen recognition by TLR3, TLR7, TLR8 and TLR9 among other PRRs. The viral PAMPs recognized by these receptors include: double-stranded RNA (dsRNA), single-stranded RNA (ssRNA) and double-stranded DNA (dsDNA) (24-26). 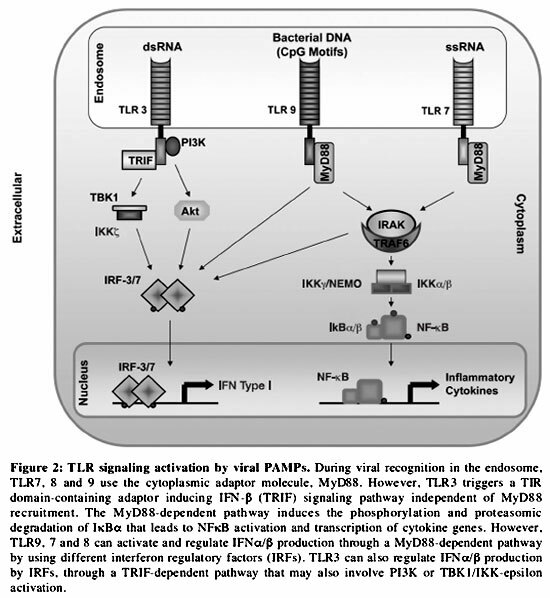 TLR7 and TLR8 recognize viral and non-viral ssRNA and activate cytokine production through interferon regulatory factor 3 (IRF3) and IRF7 (Figure 2) (27, 28). TLR7 responds to ssRNA producing interferon type I (IFN type I) and pro-inflammatory cytokines (29-31). TLR7 is highly expressed in plasmocytoid dendritic cells (pDC), specialized in IFN type I (α/(ß IFN) production against viral infections (27, 32). TLR7, 8 and 9 are closely related phylogenetically and, together with TLR3, they are distributed in endosomal compartments exposing the TIR domain toward the cytoplasm. For cellular activation, these TLRs require ligand internalization to the endosóme (33) and activation of intracellular signaling pathways that involve IRFs that lead to α/(ß IFN production ß1, 32, 34-36). Pro-inflammatory pathways and the expression of co-stimulatory molecules are activated by viral PAMPs in antigen presenting cells (APCs). The IFN type I pathway plays a central role in antiviral host response as its activation leads to increased interferon stimulated genes (ISGs) expression, thus promoting an antiviral state (24, 37, 38). Currently, it is proposed that TLR3 may have a potential role in the cross- priming process in CD8+ cell responses to virus infected dendritic cells ß9). TLR8 is mainly expressed in myeloid dendritic cells (mDC) and in macrophages and its activation by ssRNA induces pro-inflammatory cytokines in a MyD88-dependent manner (40). TLR9 senses DNA from Murine Cytomegalovirus (MCMV) (41, 42) and Herpes Simplex virus 1 and 2 (HSV 1 and HSV2) (36,43). Almost all TLRs have a common signaling pathway, in which adaptor molecules forming a molecular complex with TIR domain initiate signaling events. TLRs activation firstly recruits MyD88, a common adaptor protein that is fundamental in the innate immune response activation (Figure 1 and 2). MyD88 has a C-terminal TIR containing portion (residues 155-296) that associates to the TLR- TIR domain (44). MyD88 N-terminal corresponds to a death domain (DD), that mediates interactions with other DD-containing proteins (45). MyD88-DD has been implicated in TLR-induced cell death (46). Interestingly, data from our laboratory have shown that MyD88 has canonical nuclear localization and export motives that may be involved in protein nuclear-cytoplasmic transit that may have an impact in cell death when TLR2 is activated (47). MyD88 also has an intermediate domain (ID) that is crucial in TLR signaling as it interacts with IL-1R associated kinase (IRAKs). Another adaptor factor in TLR signaling closely related to MyD88 is the TIR domain-containing adaptor protein/MyD88-adaptor-like (TIRAP/Mal) (48). TIRAP-deficient mice have an impaired production of cytokines and activation of NFκB and activating protein-1 (AP-1) when TLR 2 and 4 are activated (49, 50), making TIRAP a crucial regulatory step in innate immune pro-inflammatory responses. Downstream from MyD88 the IRAK proteins transduce signaling events. The IRAK family is formed by serine/threonine kinases, of which four members have been described: IRAK-1, IRAK-2, IRAK-4 and IRAK-M. Each protein contains a DD in its N-terminus and a kinase domain at the central portion. IRAK-1 and IRAK-4 have auto- and cross-phosphorylation kinase activity, and IRAK-2 and IRAK-M are inactive proteins, as they lack an aspartic acid residue in the kinase domain (51). As predicted, IRAK-4 -/- mice are resistant to LPS, demonstrating its important role in TLR4 signaling regulation (52). All IRAK proteins, except IRAK-4, contain a TRAF-binding motif, suggesting that IRAK-4 indirectly interacts with TRAF6 (TNF receptor associated factor 6) (53). TRAF proteins have an N-terminal zinc-binding domain, and a C- terminal domain that leads to self-association and interaction with receptors and signaling proteins. TRAF6 regulates distinct processes of innate and adaptive immunity, mediated by IkB kinases (IKK) and mitogen-activated protein kinases (MAPK) that regulate NFκB and AP-1 transcription factors. However, how IKKs and MAPK are activated by TRAF6 still remains unclear (54-56). Another signaling pathway activated downstream from MyD88 and TRAF6 is the formation of the IRF7 complex when a ssRNA or CpG-DNA motif from either viruses or bacteria binds to TLR7 or TLR9, respectively; all these events conduce to the activation of IFN type I transcription (27). A crucial event in pro-inflammatory signaling activation is the interaction of IRAK-4 with MyD88-ID domain that promotes, after recruitment to the receptor TIR domain, the phosphorylation of IRAK-1. Once IRAK-1 is phosphorylated TRAF6 is recruited to the TLR complex. Finally IRAK-1 and TRAF6 dissociate from the TIR/MyD88/IRAK-4 complex and interact with membrane-associated proteins, such as TAK1 (transforming growth factor-(ß-activated kinase 1), TAB1 (transforming growth factor-(ß-activated protein kinase 1-binding protein 1) and TAB2 that are part of the multicomplex IRAK-1-TRAF6-TAK1-TAB1-TAB2 (57). When TAK1 and TAB 2 become phosphorylated they induce IRAK-1 dissociation from the complex and further IKKs and MAPKs activation (55). Recent studies showed that TRAF6 can bind ubiquitin-conjugating enzymes Ubcl3 and UevlA, that are critical in the activation of TAK1 -mediated phosphorylation of IKK and MKK (MAPK Kinases) (58, 59). The ubiquitination of TRAF6 mediates NFκB activation through a process that does not require protein degradation (59). The IKK complex has been reported to be important in the regulation of transcriptional activity through NFκB. This protein complex is formed by two kinases: the IKKα and the IKKß, where IKKα is crucial for the phosphorylation of IκBα mediated by IKKß (60). The mechanism by which the IKK complex induces NFκB activation involves the phosphorylation of IκBα in a serine residue followed by its proteasomic degradation, allowing NFκB nuclear translocation and the expression of pro-inflammatory cytokines and adhesion molecules . Some TLR signaling pathways, such as these activated by TLR3 and TLR4, do not use MyD88 as an adaptor protein to trigger innate immune responses. TLR3 and TLR4 expressed in APCs require the TIR domain-containing adaptor inducing IFN-ß (TRIF) protein to induce NFκB activation and interferon and co-stimulatory molecule expression (61). TLR4 activation by LPS may induce the expression of the TRIF-related adaptor molecule (TRAM/TICAM-2) that binds to TLR4 and to TRIF. TLR4 utilizes the adaptors TRIF and TRAM independently of Mai and MyD88 to initiate the late phase of NFκB activation and also to induce the expression of IFN-ß and other IFN-inducible genes via the transcription factor IRF-3 (Figure 1) (61, 62). TRAM, like Mai, acts as a bridge to couple TRIF to TLR4 and is absolutely required for TLR4 mediated responses. TRAM-/- mice are completely impaired in their responses to LPS while Mai or MyD88 deficient mice do respond albeit with delayed kinetics (49, 50). When TLR3 signaling pathway is activated by viral dsRNA, TRIF is recruited to the receptor and induces IFN type I through TRIF-IKK-epsilon (Figure 2). Furthermore, agonist activation of TLR3 may promote tyrosine phosphorylation that allows phosphatidylinositol 3-kinase (PI3K) recruitment, Akt activation and finally IRF-3 phosphorylation (63). 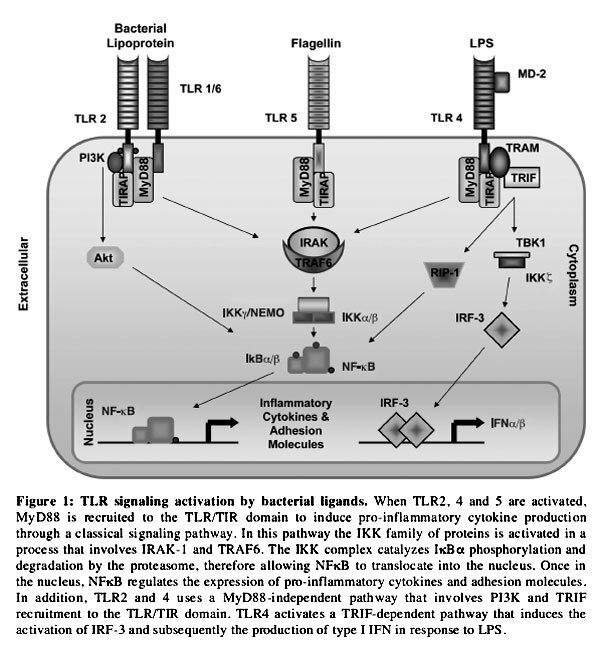 TLR3 can, in addition, stimulate pro- inflammatory cytokine expression by connecting the TRIF downstream signaling molecule to NFκB activation (Figure 2) (64). Pathogen recognition through TLRs always induces pro-inflammatory cytokine expression (65). A balance between TLR activation and inactivation is crucial to avoid an excessive inflammatory response, as occurs in autoimmune, chronic inflammatory and infectious diseases. TLR pathway activation may be regulated by several molecules that keep a balance between health and disease, involving extra- and intracellular regulators, as well as regulatory receptors. Soluble forms of TLR have been reported as extracellular regulators of pro-inflammatory response that trigger innate immunity. The soluble form of TLR2, sTLR2, is produced by a post-translational modification of the anchored TLR2 that is constitutively expressed in blood monocytes, and found in human plasma and milk. Inhibition of sTLR2 splice variant expression increases cellular response to bacterial lipopeptide (66). The soluble product sTLR4 is an alternative splice variant of TLR4 that was shown to be expressed as a mechanism to inhibit LPS -mediated TNFα production and NFκB activation (67), blocking MD-2 recruitment to the TLR4-CD14 complex. Finally, a soluble form of TLR5 (TLR5s) has been described in fish and it is involved in the response of flagellin that induces an increased NFκB activation by a cellular mechanism that is not completely understood (68). Several intracellular adaptors and kinases have been reported to endogenously regulate the expression of pro-inflammatory molecules upon the activation of TLRs. The splice variant form of MyD88, MyD88s, encodes a protein that lacks the ID and is constitutively expressed in spleen. MyD88 can be induced in monocytes by long term exposure to LPS (69). The mechanism by which MyD88s reverts inflammation involves IRAK-4 sequestration by MyD88s that prevents further phosphorylation of IRAK-4 and IRAK-1 and activation of NFκB (70). MyD88s does not prevent AP-1 activation, indicating that MAPK activation is part of an independent pathway that diverges from MyD88 signaling (71). IRAK-M is another negative regulator of the TLR pathway, and together with IRAK-2, they are the members of the IRAK family without catalytic activity. IRAK-M expression has been reported to be restricted to monocytes and macrophages. IRAK- 2 and IRAK-M can reconstitute IL-1 response in the 293 cell line that does not endogenously express IRAKs (72). IRAK-M and IRAK-2 block pro-inflammatory cytokine expression by dissociating the complex formed by MyD88-IRAK-l/-4 and IRAK-TRAF6. IRAK-M -/- mice show an over-production of inflammatory cytokines in response to LPS and bacterial DNA-like CpG motifs (73), suggesting that IRAK-M plays an important role in regulating the MyD88-dependent signaling pathway. The suppressor of cytokine signaling proteins, SOCS, are a family of 8 proteins that are induced by cytokines. SOCS1 and SOCS3 are relevant members that regulate the TLR4/NFκB signaling pathway in macrophages (74). Macrophages from SOCS3-/- mice exposed to IL-10 and IL-6 showed suppression in LPS-induced TNFα production (75). PI3K has been also implicated in TLRs signaling (76), suppressing both MAPKs and NFκB in response to LPS, thereby decreasing TNFα production (77). PI3K regulates immune responses by blocking IL-12 and limiting TH1 polarization (76). PI3K is an enzyme that catalyzes the phosphorylation of phosphatidylinositol 4,5-bisphosphate (PIP2) to phosphatidylinositol 3,4,5-trisphosphate (PIP3). PI3K is composed of a p85 regulatory subunit and a pi 10 catalytic subunit. PI3K usually is recruited to phosphorylated tyrosine residues within YXXM motifs through SH2 domains. Stimulation of TLR2 expressing cells with Staphylococcus aureus promotes PI3K recruitment to the TIR domain and induces transactivation of the NFκB subunit p65 by a mechanism that seems to be independent of IκBα proteasomic degradation (78). In neutrophils stimulated with peptidoglycan, that activates TLR2 signaling pathways, and concomitantly with a PI3K inhibitor, the TNFα secretion and p65 transactivation were greatly reduced (79). Altogether these findings indicate that PI3K seems to participate in pro- or anti-inflammatory immune responses depending on the cell type and the TLR2 stimulus used. The Toll-interacting protein (Tollip) is another inhibitory adaptor molecule that was firstly identified as an intermediate in IL-1R signaling pathway (80). Tollip is recruited to the TIR domain and decreases IRAK-1 phosphorylation upon LPS activation. IRAK-1 activation by MyD88 promotes Tollip dissociation from the TIR domain (81). It has been shown that PI3K regulates the inhibitory effects of Tollip, by interacting with 3'phosphorylated phosphatidylinositides (82). Nucleotide oligomerization domain receptor (NOD2) is a mammalian cytosolic PRR, and polymorph variants have been associated to Crohn's disease (CD) (83). NOD2 protein is constituted by two caspase recruitment domains (CARD), a NOD region and a tripartite domain, consisting of a C-terminal LRR. This last domain recognizes and reacts to the bacterial component muramyl dipeptide (MDP), and is the site with major genetic variability (84, 85). NOD2 variants that are associated with CD, do not respond to MDP stimulation (86). NOD2 -/- macrophages stimulated with TLR2 agonists respond to peptidoglycan (PGN) by releasing high levels of interleukin-12 (IL-12) and increasing NFκB activation. On restoring the NOD2 phenotype, NFκB activation and IL-12 expression are lower, concluding that NOD2 is a negative regulator of TLR2 (87). ST2 is a member of the Toll/IL-IR protein family, that also regulates the TLR pro-inflammatory pathway (88). ST2 was originally identified as a gene induced by serum or oncogenes in mouse fibroblasts (89). Three distinct ST2 gene products, generated by alternative splicing have been described: a soluble secreted form (ST2s), a transmembrane receptor form (ST2L), and a variant form (ST2v) (90- 92). ST2s is constitutively expressed in hematopoietic and non-hematopoietic cells (93), ST2L in TH2 lymphocytes but not TH1 cells (94, 95), and ST2v in intestinal cells (90). ST2s behaves as immune modulator in in vitro and in vivo assays by using anti-ST2 antibodies or a recombinant ST2s protein (96-98). ST2L is a type I transmembrane protein with three extracellular immunoglobulin-like domains and an intracellular TIR domain. ST2L can drive MAPK activation, but it also downregulates NFκB activation in response to IL-1 or LPS stimulation (61). A possible mechanism for ST2L immune modulation involves its interaction with molecular adaptors of TLR/IL-1 inflammatory pathways. ST2L can sequestrate MyD88 and Mai through their TIR domains, and therefore can block the effect of TLR4-mediated NFκB activation (99). Recently IL-33, a member of the IL-1 family, was reported to block NFκB and MAPKs activation through ST2L. IL-33 drives anti-inflammatory TH2- associated cytokine production from in vitro polarized TH2 cells (100). The negative regulation of ST2s is different to that described for ST2L. In pro-inflammatory conditions and asthma ST2s is up-regulated (93, 101); although the mechanism of action is currently unknown, ST2s can induce anti-inflammatory effects by diminishing TH1 pro-inflammatory cytokines. Moreover, in LPS-activated macrophages, ST2s downregulates TLR4 mRNA expression (96). SIGIRR (single Immunoglobulin IL-1R-related molecule or TIR8) is a negative regulator of the IL-1R and TLR4 pathways that does not affect NFκB and AP-1 activation (102). SIGIRR interacts with IL-1R and TLR4 in a ligand-dependent manner and inhibits their signaling (102, 103). SIGIRR is a member of the Interleukin-1 receptor (IL-1R) family. SIGIRR has one immunoglobulin domain in the extracellular structure and a long TIR cytoplasmic domain, both segments being involved in the IL-1R/TLR4 response inhibition (103, 104). TLRs are vital players in infectious and inflammatory diseases. Mainly because of their influence in adaptive immunity activation, manipulation of TLR signaling is a potential and up-to-date therapeutic target for diverse human diseases. Much of the knowledge about TLR function in human disease is based on analysis of individuals with TLR gene polymorphisms (105). Among these, the role of the TLR4 polymorphism Asp299Gly in sepsis caused by Gram-negative bacteria but not by polymicrobial agents particularly important (106). The alíele 299Gly has been also linked to severe bronchiolitis generated by respiratory syncytial virus that also activates the TLR4 pathway (84). Exposure to LPS exacerbates preexisting asthma severity (probably by increasing airway inflammation) but, paradoxically, it decreases asthma incidence later in life, and also atopy severity (105, 107, 108). Allelic 299Gly polymorphism also has a protective role in rheumatoid arthritis (109), Crohn's disease and ulcerative colitis development (110), among other diseases. Other TLR polymorphisms with clinical relevance include: TLR2 Arg753Gln, which predisposes to staphylococcal infections (111) and tuberculosis (112), and TLR5 common stop codon (392STOP) that results in decreased flagellin signaling and increased susceptibility to Legionella pneumophila (23). TLRs have been also implicated in allergic reactions with a TH2 immune pattern; it has been postulated that LPS at very low doses promotes a TH2 response through a MyD88-independent pathway, but at infective doses, LPS leads to a TH1 response (113). Based on these findings and the ability of R-848 (resiquimod), a synthetic TLR7 and TLR8 ligand, to shift to a TH1 response, it is actually used to transform a characteristic TH2 into a protective TH1 response (114). Although early-response cytokines play an important role in host defense, their entry into the systemic circulation can bring about a widespread microvascular injury. Certain TLRs such as TLR2, TLR4 and TLR6, are expressed in cardiomyocytes and may play a critical role in cardiovascular collapse pathogenesis that occurs during sepsis. Signaling via TLR4 in cardiomyocytes is supposed to be responsible, at least in part, for production of mainly TNFα, IL-1ß and nitric oxide, leading to heart damage and left ventricular dysfunction (115-118). The role of TLRs in viral disease progression is not yet completely elucidated. Certain viral proteins that directly bind to TLRs could be important therapeutic targets able to suppress or activate receptor signaling in diverse clinical contexts. Host defense against virus involves IFN type I production that leads to IFN-stimulated gene expression, with the resulting activation of antiviral, antiproliferative and immunoregulatory responses (119). 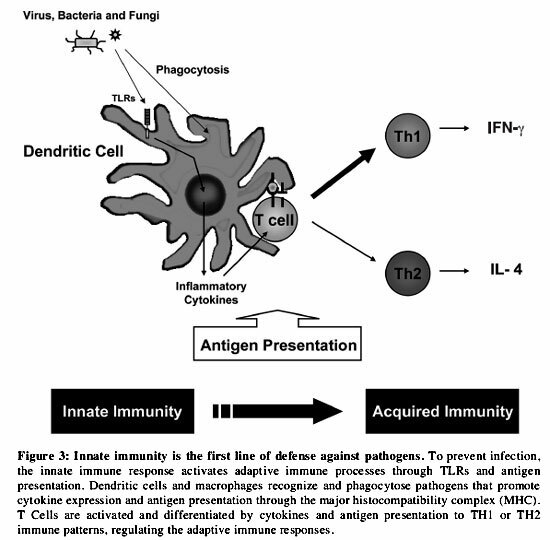 Among others, herpes simplex virus has been shown to induce IFN type I production by plasmocytoid dendritic cells through a mechanism that involves TLR9 activation (43, 120). Induction of TLR9-mediated mucosal innate immunity by specific receptor agonists could provide protection against these viruses (25). To date, synthetic TLR7 and TLR8 agonists such as imiquimod, have been found to be a useful treatment for viral pathogens and skin cancers (121). Cancer has been linked to innate immunity, as tumors can be eradicated in conditions where the local environment resembles an infection (113). In this context, murine models have been used to investigate the role of CpG oligodeoxyribonucleotides as immunotherapeutic agents against various solid tumors including colon carcinoma (122) and lymphoma (123). Systemic autoimmune diseases, such as rheumatoid arthritis (RA) and systemic lupus erythematosus (SLE) are characterized by production of auto- antibodies. During the last years, an unexpected role for TLRs in triggering B cells to produce rheumatoid factor (RF) has been described. B cells were shown to be activated by a mechanism that seems to be independent from T cell activation and appears to be mediated by TLR9, which is restricted in humans to B cells and plasmocytoid dendritic cells (124). IgG2a-chromatin immune complex activates RF- specific B cells by a dual engagement of the antigen receptor and TLR9 (125). In SLE numerous auto-antibodies are generated, and the recognition of unmethylated CpG-DNA by TLR9 raises the question of the receptor's role in the disease pathogenesis. The presence of unmethylated CpG-DNA in immune complexes may promote their intracellular uptake and activation of endosomal TLR9 leading to pro-inflammatory responses that can be related to the SLE activity seen during recurrent microbial infections (126-128). If impaired tolerance to self DNA turns out to involve TLR9 then, TLR9 antagonists emerge as interesting potential therapeutic tools against SLE. Various dermatological disorders have been also linked to impaired innate immune responses. Normal keratinocytes express TLR1, TLR2 and TLR5, switching their TLR pattern expression as they mature (129). TLR2 and TLR4 expression in normal cultured human keratinocytes, increases in response to LPS plus IFN-γ, Candida albicans, mannan and Mycobacterium tuberculosis (100, 130). Among others, psoriasis and acne vulgaris are two prevalent dermatological diseases in which TLR may play an important pathogenic role. In psoriasis, a chronic inflammatory skin disease characterized by a THl-type cytokine profile, TLR2 has been found to be strongly expressed in upper epidermis of psoriatic plaques, whereas in normal and non-lesional skin, it appears to be more highly expressed in the basal layers (129). The study of distinctive TLR and heat-shock protein expression patterns by specific cell subsets in normal and psoriatic skin shows a stronger and more diffuse TLR1 expression in basal psoriatic keratinocytes (131). In acne vulgaris, TLR2 is expressed at the site of disease, indicating that the associated inflammation is triggered by the receptor's activation (121, 132). The ability to appropriately respond to pathogenic assault is critical to survival, and the TLRs are the first point of contact that we have with invading organisms. The mechanisms regulating the TLR response must be controlled tightly, first to respond properly to the pathogenic challenge and second, to avoid excessive activation of the TLR signaling pathway and thus, to control damaging injury to the host system following TLR activation. The complex mechanisms by which TLR signaling may be regulated are emerging in the literature. Ultimately, better understanding of the mechanisms behind TLR activation will hopefully lead to the development of novel therapeutic strategies in the treatment of inflammatory diseases and autoimmunity. We thank E. Medlin and C. Arancibia for critically revising the manuscript and Dr. A. Goecke for constructive discussion.